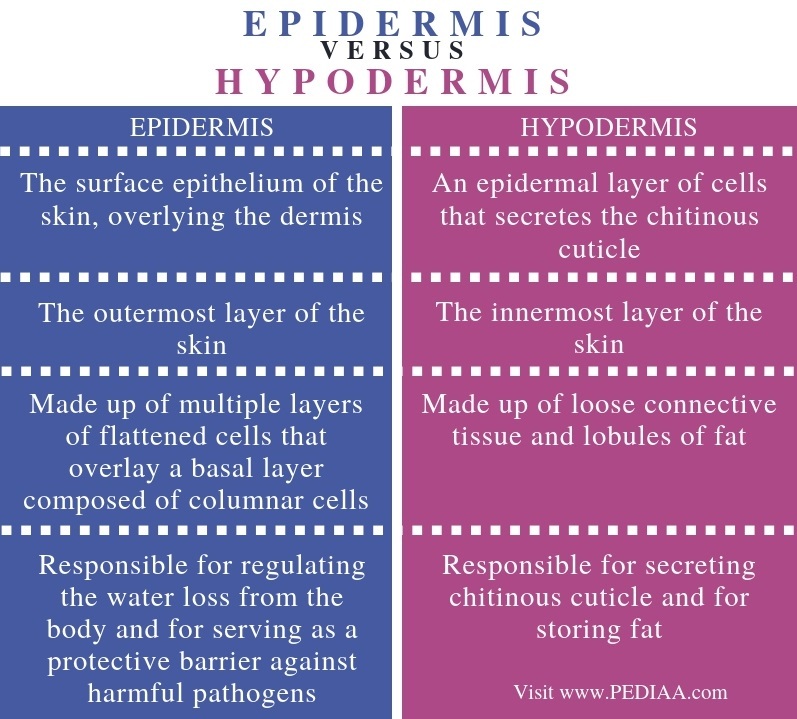 The main difference between epidermis and hypodermis is that epidermis is the outer protective layer of the skin of vertebrates, covering the dermis, whereas hypodermis is the subcutaneous tissue found in the lowermost layer of the skin. 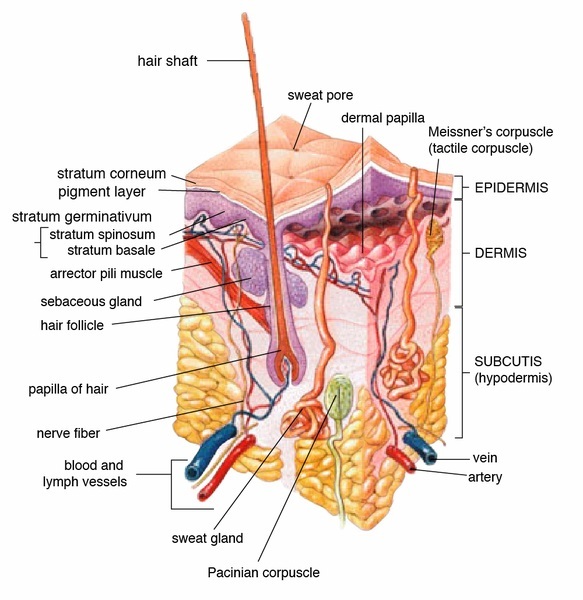 Epidermis and hypodermis are two layers of the integumentary system of animals and plants. 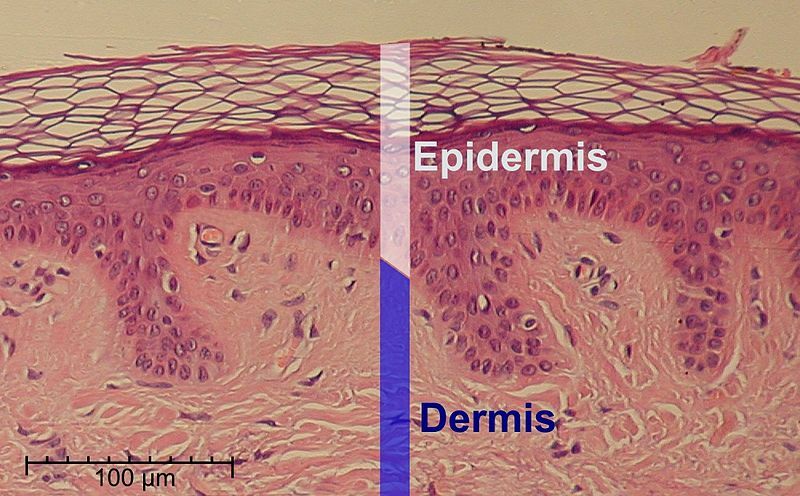 Epidermis serves as the outer layer of cells in both invertebrates and plants while hypodermis is present immediately below the epidermis in plants. The epidermis is the outermost structure of the skin of animals and plants. In vertebrates, the other two layers of the skin, dermis, and hypodermis occur beneath the epidermis. Also, the epidermis of vertebrates consists of multiple layers of dead cells that are flattened. Additionally, epidermis consists of columnar epithelial cells on the basal membrane just below the dead cell layer. On the other hand, the epidermis of invertebrates is one-cell thick and is covered by an impermeable cuticle. However, the epidermis of plants is made up of a single layer of parenchyma cells. Furthermore, the main function of the epidermis is to protect the internal structures of the body from pathogens and mechanical damage. It also prevents water loss from the body. In plants, the epidermis is responsible for the regulation of gas exchange. The epidermis of roots is responsible for the absorption of water and minerals. In addition, the epidermis of plants is replaced by the periderms during their secondary growth. The hypodermis is the innermost layer of the skin of both animals and plants. In vertebrates, hypodermis or subcutaneous tissue is made up of loose connective tissue and fat lobules. Therefore, fibroblasts, adipose cells, and macrophages are the three main types of cells in the hypodermis. It also contains blood vessels and nerves that are larger than those in the dermis. One of the main function of the hypodermis of vertebrates is to store fat, which serves as an energy source later. Moreover, this fat layer serves as an insulator, which helps to regulate body temperature. Furthermore, in invertebrates such as arthropods, hypodermis is responsible for the secretion of the chitinous cuticle. However, in plants, hypodermis is also the outermost layer of the cortex. In addition, hypodermis occurs in leaves, seeds, and fruits. Epidermis and hypodermis are two layers of the skin or the integumentary system of animals and plants. Also, the main function of these structures is to protect the internal structures of the body. Epidermis refers to the surface epithelium of the skin, overlying the dermis while hypodermis refers to an epidermal layer of cells that secretes the chitinous cuticle. The main difference between epidermis and hypodermis is that epidermis is the outermost layer of the skin while hypodermis is the innermost layer of the skin. While the epidermis is made up of multiple layers of flattened cells that overlay a basal layer composed of columnar cells, hypodermis is made up of loose connective tissue and lobules of fat. Hence, this is also a difference between epidermis and hypodermis. Moreover, another difference between epidermis and hypodermis is their function. The epidermis is responsible for regulating the water loss from the body and for serving as a protective barrier against harmful pathogens while hypodermis is responsible for secreting chitinous cuticle and for storing fat. The epidermis is the outermost layer of the skin of animals and plants. It contains a dead cell layer, which helps to prevent water loss. Another function of the epidermis is to protect the body from pathogens. On the other hand, hypodermis is the innermost layer of the skin. In vertebrates, it stores fat and helps to regulate body temperature and absorb shocks. In invertebrates and plants, it is responsible for the secretion of the chitinous cuticle. Therefore, the main difference between epidermis and hypodermis is anatomy and function. 1. “The Skin.” Boundless Anatomy and Physiology, Lumen, Available Here. 2. “Hypodermis.” The Free Dictionary, Farlex, Available Here.